While the Samsung Galaxy Buds aren’t the best-sounding true wireless earbuds on the market, their long battery life, comfortable fit, and high-quality finish make them a good choice for Android users. The Samsung Galaxy Buds are the latest addition to a crowded field of true wireless headphones all trying to one-up each other on features. Offering the same convenience of the Apple AirPods (if you have a Samsung Galaxy device, that is), a solid seal for fuller sound response, and a decently good fit and finish, these are a great set of premium true wireless earbuds. Samsung users will get more functionality out of them due to the automatic pairing feature, but we feel comfortable recommending the Galaxy Buds to any Android user. Most of the true wireless headphones out there follow two schools of thought: the AirPods’ stem-based design or the Jabra Elite 65t’s no-stem, ear canal-shaped form factor. The Samsung Galaxy Buds sit in the latter camp, which is a huge positive. Occupying a footprint less than an inch, these earbuds are some of the smallest true wireless earbuds we’ve seen. That works to their advantage because it means that the pill-shaped charging case is smaller than many others in the category. The Galaxy Buds are available in black, white, or yellow, but our vote goes for black because it will likely be less prone to the wear and tear that accumulates on lighter colored tech. The design has a matte, rubbery build with a soft-touch, triangular glossy touchpad which allows for single taps to Play/Pause music and double taps to call up your smart assistant. The quarter-inch wings on each earbud are smaller than other units, which does have some implications for fit, but we love how modern and unassuming it makes the overall design. Finally, the case rounds out the whole package. It’s 2.75 inches in length and less than 2.5 inches wide, making it one of the smallest battery cases outside the AirPods charging case. Overall, it’s exactly the kind of premium look you’d want in a pair of high-end wireless earbuds. The Achilles heel of so many true wireless earbuds is the fit. Because there’s no wire, and because they’re often so small and light, they need to fit well in your ear to both stay secure and to provide decent sound isolation. 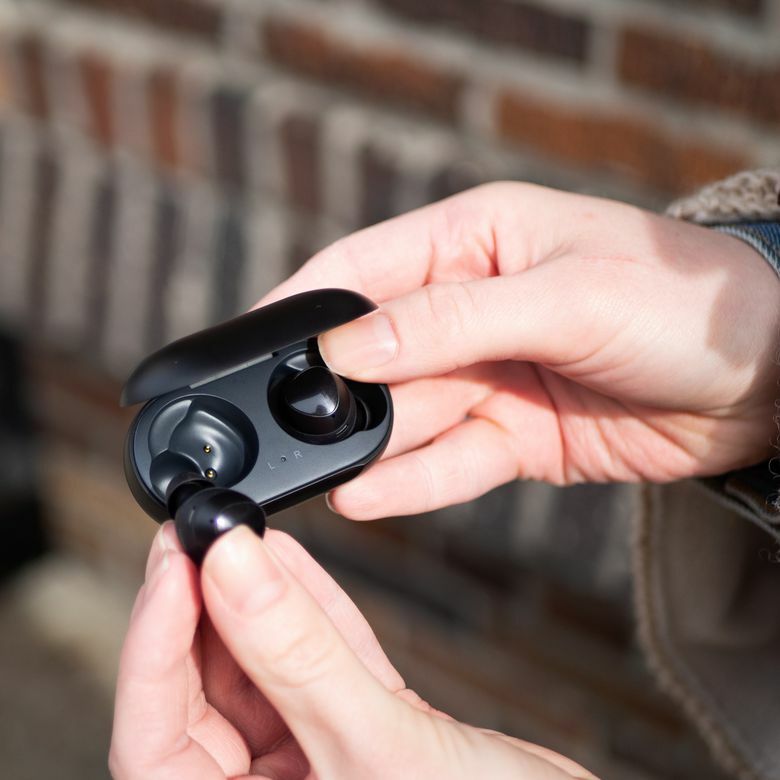 In our opinion, the Samsung Galaxy Buds offer one of the most secure fits of any earbuds we’ve tested. The solid fit gives you great sound isolation and decent resonance, particularly in the midsection of the spectrum, On the other hand, it can be a little disconcerting, giving you a clogged, claustrophobic feeling if you’re not a fan of the tight seal. It’s important to note that there are a few sizes of available eartips and wings, so you have a few different options to try in case they don’t fit. Another factor that contributes to this seal is the fact that the speaker grille opening in each ear tip is much, much smaller than most earbuds we’ve tried. This all amounts to great noise-isolation for workouts and wearing on-the-go, provided you find the right fit. Read more reviews of the best wireless headphones to purchase online. When it comes to sound quality, the Samsung Galaxy Buds are a mixed bag. As the follow-up to the Gear IconX from Samsung, we were hoping that the brand would achieve newfound quality with these latest earbuds. At first glance, it might seem like sound quality is promising. The Galaxy Buds are tuned by AKG, and the driver size seems pretty big for the enclosure, seeming to promise decent bass response. That, unfortunately, wasn’t the case. It isn’t nearly as lacking in the bass department as Apple’s Airpods, but it just won’t match other premium earbuds. What’s more, is there isn’t any advanced Bluetooth codec like Qualcomm’s aptX here, so you’ll lose a decent amount of your music’s sound quality in compression during transmission. You do have AAC, the lowest-quality SBC, and Samsung’s proprietary “Scalable” codec, but it doesn't seem to offer the quality of aptX. Much of the external noise is blocked out by the seal, which came in handy for our commute. That said, it’s not all bad. The tight seal we mentioned earlier serves to substantiate the smaller amount of bass that does exist. Even though we weren’t blown away by oomph, there’s a pleasant fullness and natural sound. Much of the external noise is blocked out by the seal, which came in handy for our commute. After spending a little over a week around NYC with the Galaxy Buds, we found they were perfectly serviceable when listening to top 40, folk, and even podcasts. If you’re looking for decent sound in a really small package, while the Galaxy Buds won’t win any awards, but they will check most listeners’ boxes. Samsung has included 58mAh batteries into the earbuds themselves, clocking the listening time into about six hours, which is really impressive considering how light these are. Plus, the battery case features a 252mAh battery that should give you upwards of four times that much without having to visit a wall charger. Of course, these predictions are largely dependent on connectivity, use, and lifestyle. Our tests didn’t quite drain the battery on a single listen, but we were definitely trending toward what Samsung advertises. It’s not a scientific outlook, but it’s really refreshing that such an optimistic runtime seems to hold true. We used our earbuds between a laptop and an iPhone, but we anticipate with the improved connectivity afforded by pairing with Galaxy devices, you might just get better battery life if you own a Samsung device. Add this to the fact that the battery case has wireless charging baked in and a more modern USB-C input, and the Galaxy Buds stand out from the crowd. It’s unavoidable that the popularity of AirPods makes them a key comparison for true wireless earbuds. A large part of the appeal of Apple’s appeal is the premium build. The Galaxy Buds get almost all the way there. The crisp snap of the case, and the lightly magnetic click of the buds when you drop them in, culminate in a fit and finish much more satisfying than Jabra’s Elite series. Overall, it’s exactly the kind of premium look you’d want in a pair of high-end wireless earbuds. However, the soft-touch plastic, while pleasantly light on the weight front, concerns for longevity. They just don’t feel like they’d take too many drops on hard pavement. Samsung also advertises that the earbuds are resistant to water, but then gives that resistance a rating of IPX2. This means that it isn’t resistant to dust (that X would be a number if it was), and that it’s only the second level of water resistance. This means that it’s mostly protected from dripping water and light sweat, but it won’t be protected in heavy rain, let alone being submerged. Samsung does offer some fitness functionality here, as there’s an onboard accelerometer, so there are some work out features if you’re so inclined. But, while the case may seem sturdy and premium, the earbuds themselves seem to sacrifice some ruggedness in favor of lightweight. You can use them for exercise, but we wouldn’t necessarily say they’re designed for it. If you’re in the Apple ecosystem, one of the best things about the Airpods is the automatic pairing that happens as soon as you flip open your case. If you have a Galaxy device, you can enjoy almost the same experience. The Galaxy Buds will automatically pair with your Samsung device just like the Airpods, right down to the popup notification. If you’re using an iPhone or a different kind of Android phone, pairing is still pretty seamless. However, because Samsung is using a proprietary codec, alongside the lower-quality SBC and AAC codecs, you aren’t going to get the seamless connectivity you’d get from something like aptX. That means there’s some connectivity issues while watching videos or gaming in the form of some slight audio lag. It’s unavoidable on most wireless earbuds, and we found that it wasn’t noticeable unless you were looking for it. Another benefit to using an Android device with the Galaxy Buds is that you’ll have access to software that further extends the sound quality and functionality. There’s a somewhat limited EQ option that lets you choose between various presets customized for the music genre you’re listening to. You can also see the battery level in each individual earbud which is particularly handy if you’re using a single one as Bluetooth headsets for phone calls. You can also choose to amplify ambient sounds, which is helpful if you want to remain alert to your surroundings, considering how well the Galaxy Buds isolate sound. All in all, we’re going to put the Galaxy Buds right in the middle of the pack for functionality, with a slight edge given to them if you have access to the accompanying app that’s not available for iPhone users. Take a peek at our guide to connecting bluetooth headphones. At $129.99 MSRP, the Galaxy Buds are priced very well in our opinion. Many premium true wireless earbuds push upwards of $200, making the Buds seem affordable by contrast. It feels especially fair when you factor in the decent sound quality, the beautiful fit, and the near-category-leading battery life. If you want something that will withstand heavy rain, and will last you through a bunch of drops, you’ll want to shell out some more for something more fitness oriented like the Jabra Elite 65t or Elite Active. But if reasonable pricing is your top priority, the Galaxy Buds should definitely be on your radar. Apple AirPods: We’ve mentioned the Airpods a few times already in this review, so it’s no surprise to see them here. If you want the convenience of pairing with your iPhone, and you need the smallest form-factor, Apple naturally has the edge here. Bose Soundsport Free: The Bose Soundsport wired headphones are some of the best Bluetooth headphones around, and their true wireless Free versions are amazing picks if you like the Bose look. While the earbuds are bulkier, they feel sturdier than the Galaxy Buds. Jabra Elite 65T: Many reviewers put the Jabra Elite 65T at the top of their list. With their great sound quality and excellent connectivity, it’s easy to see why. But, we were surprised to see just how much nicer the Galaxy Buds felt, both in fit and in the overall package. The Samsung Galaxy Buds will give you a strong set of earbuds with a couple shortfalls. There’s some connectivity flakiness on the codec front, and the construction can feel a bit questionable. But the premium case, top-notch battery life, and perfectly serviceable sound quality make the Galaxy Buds an amazing addition to an already crowded field. Product Dimensions 1.6 x 3.7 x 3.4 in.